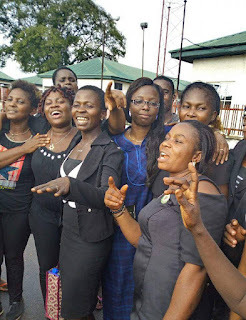 114 illegally detained IPOB women arrested on Friday, August 17, 2018, by Imo state Police command led by Dasuki Galadanchi in collaboration with APC governor Rochas Okorocha has finally regained their freedom. They were arraigned in court today August 24, 2018 after Chief Magistrate S.K. Durumba unlawfully denied them bail on August 20th 2018, under the pretence of not having the jurisdiction to entertain to the case. Surprisingly, today the court discharge and acquitted them. As at the time of filing this report, the IPOB legal team are busy perfecting their bail papers. Stay tuned for more details later.